Ana Gabriela Larios serves as the scrum master for the autonomy and sensors part of the Leidos Autonomous and Unmanned Surface Vessels team. In this capacity, she’s responsible for advancing the state-of-the-art in autonomous vessel testing, and her team is tasked with developing and deploying advanced technology solutions that address maritime missions. Ms. Larios’ work is of national import for a broad range of customers across government agencies across the United States Department of Defense and Intelligence communities, as well as commercial clients. The team that she coaches started with six people before adding eleven new team members this past summer. With her group, Ms. Larios focuses on advancing the use of simulations to study autonomous behavior and data analysis tools to isolate the behavior seen in on-water testing. The team’s recent work was impressive enough to earn the Group Technical Excellence award from Leidos’ Advanced Solutions Group, recognizing her ability to show her technical depth in managing test events, directing remote operators to execute tests, and diagnosing autonomy behavior on the fly. Ms. Larios formally joined the company only last year after an impressive internship with Leidos as part of her studies earning a B.S. degree in computer science at The University of Maryland, College Park (UMD). Described by her co-workers as “driven,” she has already taken on the diverse roles of technical developer, system tester, proposal writer, technical illustrator, and team leader. 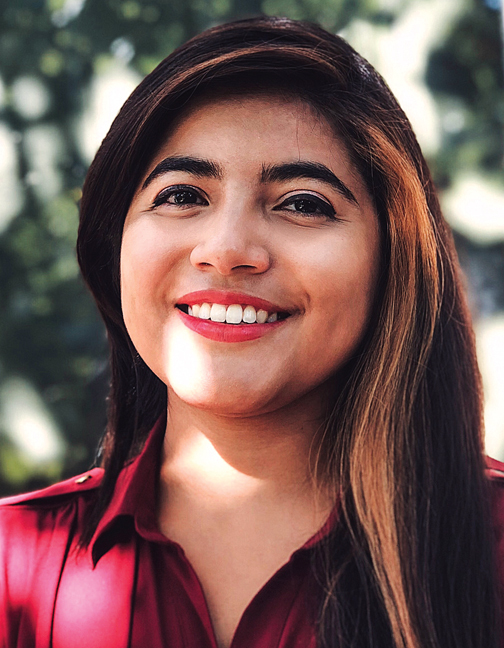 The daughter of two Salvadoran dentists who inspired her to work hard and pursue her dreams, Ms. Larios struggled at first with her computer science curriculum, a path she chose only after being denied entrance to UMD’s engineering school despite applying with a 4.0 GPA. Her determination to succeed, coupled with the support she found from the local chapter of the Association for Women in Computing, helped her overcome her early difficulties and master her courses. Her desire to create a similar support group for Latinos led her to become the president of the Computer Science Latino Group at UMD. Besides Ms. Larios’ passion for STEM, she has an artistic side that is equally strong which she expresses through painting, drawing, and designing.